The hawthorn is a broadly spreading shrub or small tree 5–14 m tall, with a dense crown, native to temperate regions of the Northern Hemisphere in Europe, Asia and North America. The fruit is edible berry-like oval dark red fruit about 1 cm long often in groups of 2-3 along smaller branches. The fruit of the Crataegus species containing a single seed. In other species of hawthorn there may be up to 5 seeds. 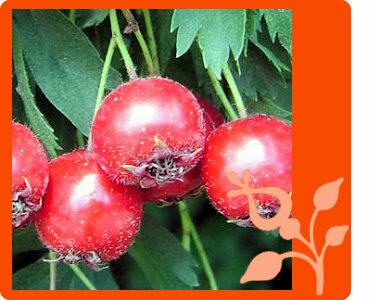 The fruit of hawthorn are edible berries commonly made into jellies, jams, and syrups. Sometimes used to make wine, or to add flavors to brandy, rather than eaten fresh. Botanically they are pomes, but they look like berries. It has a long history of use as a medicinal plant in both China and Europe. Several species of hawthorn have been used in traditional medicine. Crataegus monogyna is one of the most common species used as the "hawthorn" in traditional medicine for treating cardiac insufficiency. The plant parts used medicinally are usually sprigs with both leaves and flowers, or alternatively the fruit. Several species of Crataegus have both traditional and modern medicinal uses. It was also clinically tested as effective in reducing blood pressure (4). Hawthorn fruit is also an excellent source of antioxidants. Active ingredients found in hawthorn include tannins, flavonoids, oligomeric proanthocyanidins, flavone-C, triterpene acids, and phenolic acids (such as caffeic acid, chlorogenic acid, and related phenolcarboxylic acids). Not important as industrial crop.